Bedding Out comes out of my performance at last autumn’s SPILL Festival of Performance in which I took to my bed in a gallery for three consecutive days in response to the current welfare benefits overhaul. It was one of eight DAO Diverse Perspectives commissions (thank you DAO!). The work looks at the way I live a life in two very separate parts. There’s a public self that tries to be outgoing and happening and changing the world, and most people assume because that’s what they see of me, that’s how I am in the rest of my life. But then there’s the private self, which wins no friends or accolades, in which I spend most of my time at home, a lot of time lying down and quite a lot in bed. In the performance I take this private self and make it public, performing my bed-life. Since the public me is so carefully constructed, this is a kind of un-performing of my self. I want to make visible a twilight existence shared by thousands of us. But even more, I want to show that what so many people see as contradiction - what they call fraud - is just the complexity of real life. 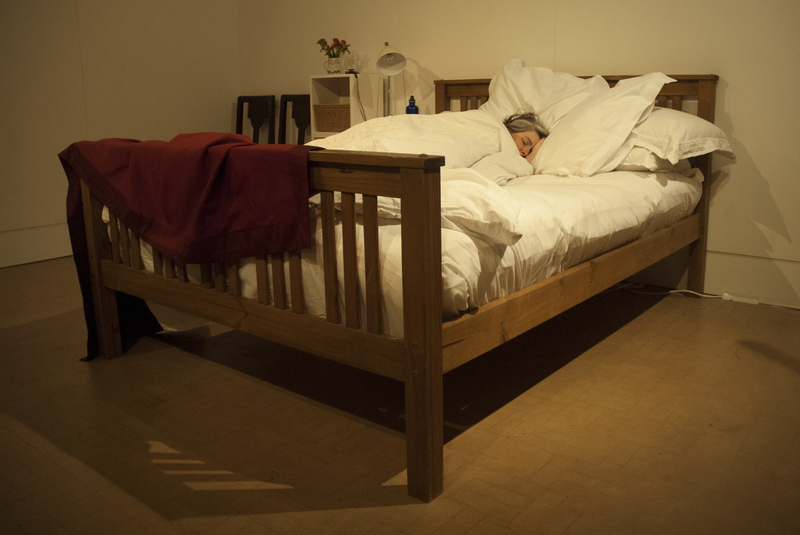 As part of last autumn’s performance, members of the public gathered around my bed for Bedside Conversations, talking about the work, its backdrop, its politics. Reflections from the Bed is short audio-visual slideshow (with captions) that tells more about the work and why it feels so necessary.